There are many options for heating the water in your home. 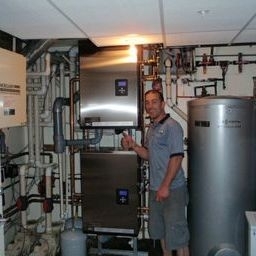 One option for home water heating is an integrated, or combination, water and space heating system. This means that your home heating system, such as a boiler, is used to heat your domestic hot water. This system is called an Indirect Fired Tank and it is a very efficient way to heat your home’s water. The term “indirect fired” is a bit misleading since they are not “fired” at all. They use the main furnace or boiler to heat a fluid that’s circulated through a heat exchanger in the storage tank. They require no fuel lines and no venting, however, they do require circulating pumps and connection to a boiler. The main advantage of these tanks is that the energy stored by the water tank allows the furnace to turn off and on less often, which can save up to 50% of your operating costs compared to conventional gas fired tanks. They are simply designed with no moving parts, making them extremely reliable. The models we use are all stainless steel and have limited lifetime warranties. At R&B Plumbing, we have found these are an excellent ad-on to an existing or new boiler installation. Proper installation and maintenance of your combination indirect fired tank can optimize energy efficiency. Therefore, it’s best to have a qualified plumbing and heating contractor, like R&B plumbing to install it. Another hot water heating option is a Hybrid Tank. 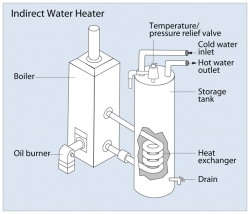 Did you know heat pumps can be used for hot water as well? If you have to use an expensive power source like electricity to heat your water, why not make it as efficient as possible? At R&B we think the Rheem Hybrid hot water heater with heat pump is the way to go. This technology uses the concept of a heat pump to make the unit twice as efficient as a standard electric water heater. A heat pump draws in the warm ambient air of the room, heats it by method of compression and uses that to effectively heat the water in the tank. Under regular demand, that can be all you need to heat the water. In periods of high demand the electric elements will be triggered. Whichever your preferred method of hot water heating, or if you just don’t know, call R&B today. We will help you. Malcolm did a fabulous job and made everything fit like it was made for the spot.